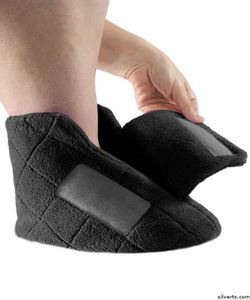 These extra wide slippers are soft and will keep your feet warm. The toe is extra wide so as to accomodate heavily swollen feet as well. The sole is non slippery for safe movement. The slippers can be closed with an easy touch. S 5 to 6 accommodates up to 13" 9"
M 7 to 8 accommodates up to 14" 10"
L 9 to 10 accommodates up to 15" 11"
XL 11 to 13 accommodates up to 16" 12"